What is a Bar or Bat Mitzvah? Where does this tradition come from? The answer is relatively straightforward, and it is important not to lose sight of the central meaning of this moment in a young person’s life. All cultures have found unique and meaningful ways to recognize that a person in their early teens is beginning a serious transition into adulthood. Most cultures have a way of recognizing the changes that occur physically, emotionally, intellectually and spiritually. Our ceremony for recognizing this entrance into adulthood is called the Bar/Bat Mitzvah. The Bar/Bat Mitzvah experience at Kol Ami begins with engaging family workshops in the 6th grade and ends with a beautiful Bar/Bat Mitzvah Shabbat service close to the young person’s 13th birthday. Weekly services in Religious School prepare our children to confidently lead the Shabbat Service. Along the way the students work extensively in one-on-one sessions with our Rabbis, our Cantor and with their own individual tutor. Each student also takes on their own mitzvah project. When does the B'nai Mitzvah process begin? The first parent meeting will take place in fourth grade. At that time you will receive information on how to request a date. The date will be given to you in fifth grade. 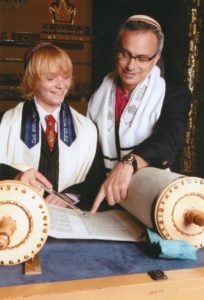 Who will help my child prepare for his/her B'nai Mitzvah? Your child will be assisted by the Rabbi, Cantor and an individual tutor that we will provide. When are B'nai Mitzvah services held? B’nai Mitzvah’s are held on Saturday mornings and evenings. Can non-Jewish family members participate in the B'nai Mitzvah service? Absolutely! We welcome non-Jewish family members to participate in all honors. Our Guide To Worship Services can be very helpful for those not familiar with our services. Right here! Our Guide To Your Kol Ami B’nai Mitzvah includes a comprehensive timeline, parent and student responsibilities, Mitzvah project ideas, service description, catering information and what to expect after your B’nai Mitavah. Learning for its own sake, as well as the opportunity to become an adult Bar/Bat Mitzvah, is encouraged. This two-year program includes a study of Jewish beliefs and practice, a conceptual introduction to holidays, life cycle rituals, great friendships, and the art of asking good questions. For more information on dates and times please contact the main office or one of our Rabbis. Attending services for the first time at Kol Ami? Read our Guide to Worship and you will feel right at home. Learn about participating in a Torah blessing. Want to learn more about the B’nai Mitzvah process at Kol Ami? Read our B’nai Mitzvah manual and our guide to Mitzvah Projects. Learn more about having your celebration at Kol Ami.